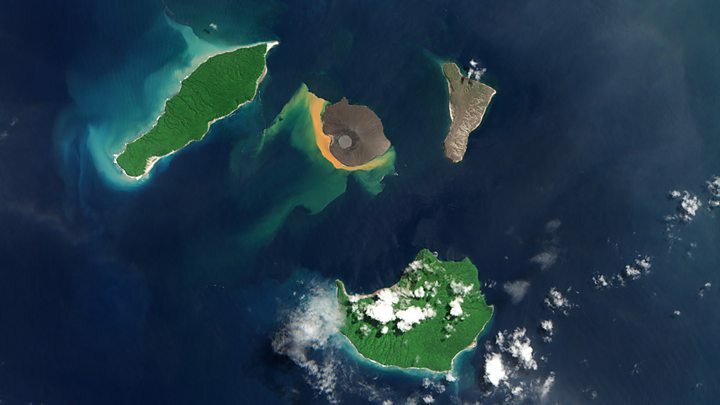 Scientists have produced a new model to illustrate the December collapse of Indonesia's Anak Krakatau volcano and its subsequent tsunami. The results indicate that 0.2-0.4 cu km of material on the southwestern flank of the volcano must have slid into the sea to produce the destructive waves. The simulation matches well the high-water readings recorded at tide gauges on Sumatran and Javan coasts. More than 400 people lost their lives in the disaster; 33,000 were displaced. The event took nearly everyone by surprise. The dangers of a landslide-generated tsunami stemming from a volcanic eruption had been under-appreciated. Local populations certainly had no warning. Scientists, also, were having to catch up, said Prof David Tappin, who presented the new model here at the European Geosciences Union General Assembly. Thinking had been strongly focused on the tsunamis from big earthquakes, the British Geological Survey and University College London scientist told reporters. "Why is Anak Krakatau interesting? Because it's the first such event we've been able to investigate using all the modern technologies and understandings that have come about over the past 20 years," he explained. "[These include] numerical tsunami modelling, particularly from non-seismic sources; satellite radar; high-resolution satellite photography before and after the event; and high-resolution seabed mapping." Anak Krakatau's collapse occurred on the evening of 22 December, during a period of renewed eruptive activity. A number of factors are thought to have precipitated what happened, including the height (340m), steepness and inherent weakness of the volcanic structure; and the fact that it had grown up close to - and had even migrated towards - the edge of a deep (220m) submarine trough. When the flank went into the sea, it would have pushed out a big wave in front of it and sucked down the water surface immediately behind. The model shows how the disturbance spread out across the Sunda Strait. 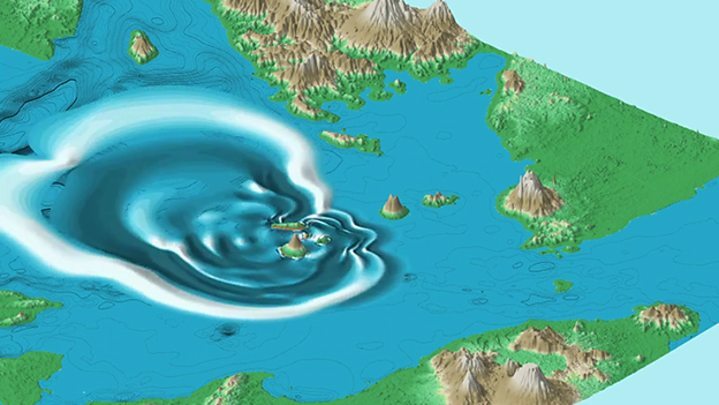 Prof Stephan Grilli, who led the modelling work at the University of Rhode Island, commented: "Numerical modelling of eruption-generated tsunamis is far less developed than for other tsunami mechanisms – such as earthquakes and landslides. "The Anak Krakatau event is timely in that it should stimulate the development of new models that will underpin improved mitigation strategies." The volcano has started to rebuild itself since the collapse. For a while, its old vent had been open to the sea, forming a small bay. This has now closed with the accumulation of new deposits. The reconstruction, Prof Tappin believes, should alert the local authorities to the need to keep monitoring Anak Krakatau. Some sort of system that provides early warning of a repeat event is essential. In addition, the British scientist says, the lessons learned need to travel beyond Indonesia to other volcanoes that share similarities with Anak Krakatau. "There are more than 40 volcanoes near the sea in the world which are potentially Anak Krakataus. When we've confidently identified the mechanism then I would hope scientists at those volcanoes will be looking to see whether they have the same hazards."